Try our twist on a classic! 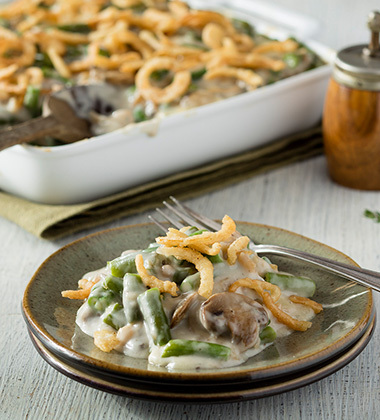 This green bean casserole combines fresh onions, mushrooms, thyme and parsley in a white wine reduction. Finish it off with brie cheese and fried onions to bring it all together. fresh thyme leaves, leaves	 1 tbsp. fresh parsley, chopped	 2 tbsp. 1. In large pot, heat oil. Add onions. Sauté for 7 minutes. 2. Add mushrooms, thyme and parsley. Cook additional 5 minutes. 3. Add white wine. Reduce by half. 4. 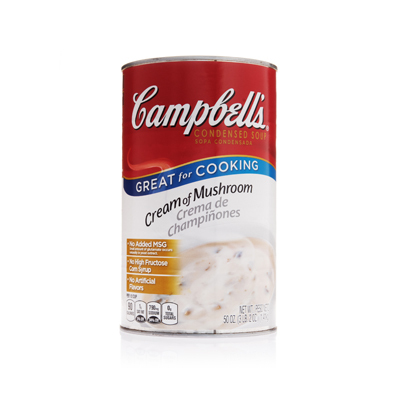 Add Campbell's® Condensed Cream of Mushroom Soup, salt and pepper. 5. Add brie cheese and half listed measurement of fried onions (5 oz; 1-1/2 cups). Mix well. 6. In large mixing bowl, combine mushroom mixture with green beans. Mix thoroughly. 7. Pour mixture evenly into a 12"x20"x2-1/2" hotel pan. Bake in pre-heated 350°F oven for 20 minutes, or until golden brown. 8. Remove from oven. Evenly top with remaining measurement of fried onions (5 oz. ; 1-1/2 cups). 9. To Serve: Using a #8 scoop, portion 1/2 cup into side serving dish. Serve immediately. fresh thyme leaves	 1 tbsp.